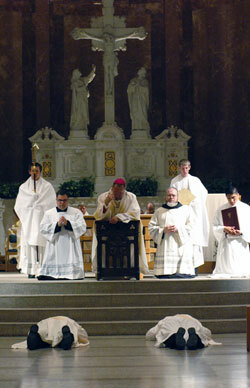 Archbishop Buechlein also encouraged those to be ordained to be steadfast in prayer. In March, Russ and Linda Jenkins had processed up the main aisle of the cathedral to give the offertory gifts to their son during an Easter Vigil liturgy during which they were received into the full communion of the Church. Less than two months later, they were processing up the same aisle, this time with their son at their side. The new priests’ parents also looked to the distant past with love. The ordination liturgy was a respite for Russ Jenkins, who works for a utility company in Rush County and had put in more than 80 hours of overtime that week because of the damage done by severe storms. Less than 500 people attended the ordination liturgy, which usually draws large numbers of the faithful. The relatively low numbers were in large part due to the massive amount of rain that fell on central and southern Indiana on the day of the liturgy. Thunder and rain pounding the roof of the cathedral could be heard throughout much of the liturgy. But the storms could not dampen the spirits of the priests and their family and friends. When they were both younger, Father Newton and his brother, Thomas, had frequently served at Mass together. Mollie Rauh, Father Jenkins’ sister, looked to her brother’s future.